South Korea’s LG Chem, one of the world’s top secondary battery makers, is building its second battery plant in China for a full capacity of powering over 500,000 electric vehicles by 2023 that would expand its output from China by 10-fold from current level to ensure competitiveness by the time Beijing ends subsidy program for EVs. LG Chem Vice President Kim Jong-hyeon on Tuesday signed a contract with the governor of Jiangsu Province and mayor of Nanging, pledging $2 billion to establish an EV battery at the Binjiang Development Zone in the capital of eastern coastal Chinese province. The new plant will have an eventual full capacity of 32 gigawatt-hours by 2023. Construction will begin in October to start operation a year later. Output will gradually increase upon demand with the aim of generating enough batteries to power 530,000 all-electric vehicles like Chevrolet Bolt and Tesla Model S running on 60kW-h packs. As of 1:37 p.m. Thursday, shares of LG Chem were up 1.81 percent at 337,000 won ($297.81). LG Chem runs a plant with capacity of 3GWh (which can power 50,000 EVs) since 2015 about 50 kilometers away from the new plant. The expansion came after the National Development Reform Commission that oversees investment in the auto sector recently resumed issuing permits to foreign makers enabling them to expand capacity to draw more foreign investment after a halt. Sales by LG Chem and other Korean battery makers in China, the world’s largest EV market, fell sharply after Beijing excluded Korean names in its EV subsidy program in a measure believed to promote domestic players. The permit is currently allowed for batteries for non-Chinese EV makers. But LG Chem hopes it can run the plant in full capacity once Beijing phases out EV subsidies by 2021. 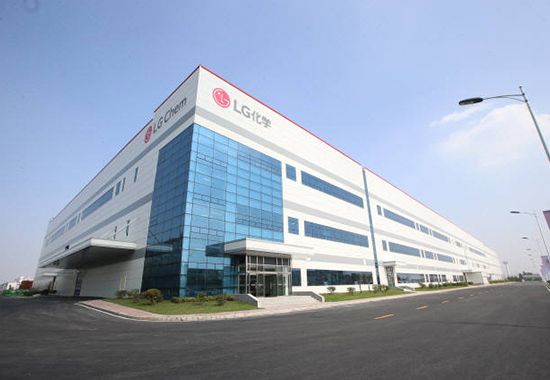 LG Chem operates four battery plants in Korea, China, Poland and the United States. The company’s share in the global battery market fell from the second to fourth last year due to sales loss in China. Separately, the company in April signed a deal with China-based cobalt supplier Huayou Cobalt to build a joint-venture to manufacture cobalt, a key material for lithium-ion batteries.